Summer is, without question, the best time of the year to enjoy this popular Spanish tradition called tapeo. Whether on holidays or in family and friends gatherings, the high temperatures are just the right push to go and have some tapas, taking delight in a varied dinner based on snacks or a little aperitif in good company. Eurofrits boasts Typical Tapas, a wide selection of first quality products… Fancy a walk out for tapas? The streets nationwide are flooded with tapas bars that have become part of the cultural identity of Spain. Even great Chefs such as Ferrán Adriá have incorporated tapas as openers in their menus, while theme restaurants around this format have sprung up. Along this process tapas have come to be regarded as miniature cuisine. Eurofrits jumped on the bandwagon back in 2004, creating our own range, Typical Tapas. At present day we have a total of 11 references, all of great quality and aimed to cover the needs of all types of consumers. “Cabrales” Cheese Croquettes or Cod & Piquillo Balls, the slightly spicy Snacks Jalapeño, Jalapeño Peppers and Chili Cheddar Nuggets are some of the most popular references in our catalogue, always made from the best original ingredients. For the younger ones we dish up Pops, a fun way to eat chicken breast, or cod with shrimp or cheese, thus becoming one of their favourite snacks. Beside those, they can enjoy Breaded Squid Fingers and various ways to eat chicken: BBQ Chicken Wings, Marinated Chicken Fingers and Chicken Fingers. Typical Tapas is a great family that will continue to grow, with novelties finding their way into our catalogue very soon. These new products will come to fill new demands in the market. 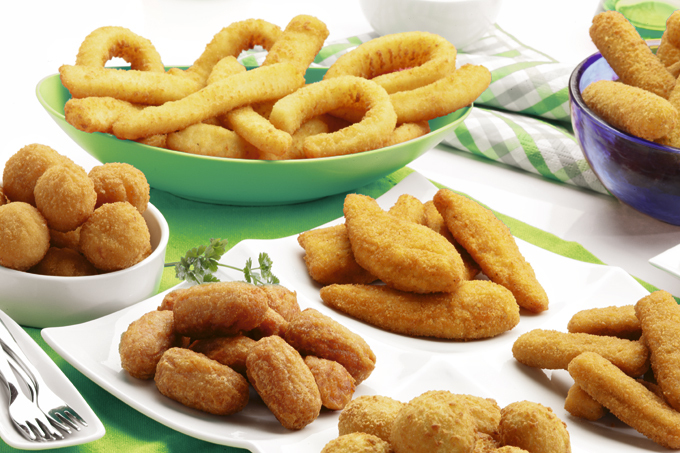 Discover the complete Typical Tapas range by clicking HERE.